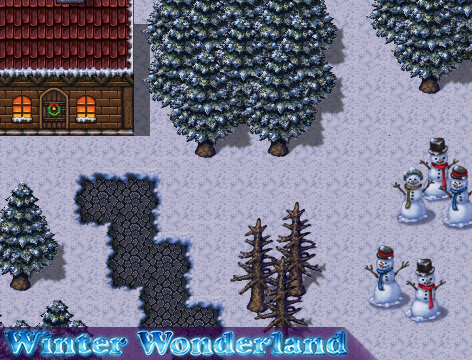 Winter Wonderland Tiles | Create Your Own Game! Happy winter holidays! Create the perfect backdrop for your winter-themed towns. 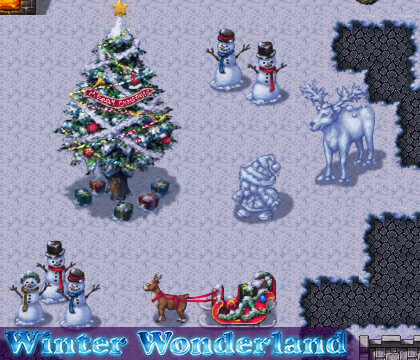 Softly gathered snow, cold sculptures and decorative accents are what makes Winter Wonderland tilesets great. Inspired by some of our favorite holiday movies, this pack is filled with details you'll need to create the iconic winter wonderland. From small villages to larger towns, celebrate the holidays with this lovely winter pack. Created in the same painterly style as Sci Fi, Halloween, Evil Castle, Dungeons & Volcanoes and Royal packs, this charming set of tiles is the perfect addition to your growing library of resources. A smooth, painterly style similar to the Sci Fi, Halloween, Evil Castle, Royal and Dungeon & Volcanoes tile packs. Animated water auto-tiles, as well as snowy town buildings and a variety of floors. Snowy mountains, cliffs and pine trees in addition to classic holiday decorations for buildings. A large variety of grandiose snow and ice sculptures.